If you want to mix fonts or colors within the text, or if you want formatting such as multiple lines, you can use HTML. 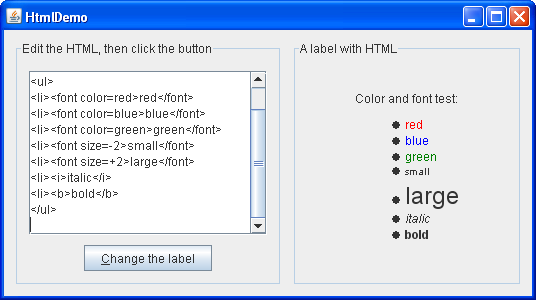 HTML formatting can be used in all Swing buttons, menu items, labels, tool tips, and tabbed panes, as well as in components such as trees and tables that use labels to render text. Here is the resulting button. An application called HtmlDemo lets you play with HTML formatting by setting the text on a label. You can find the entire code for this program in HtmlDemo.java. Here is a picture of the HtmlDemo example. Click the Launch button to run HtmlDemo using Java™ Web Start (download JDK 7 or later). Alternatively, to compile and run the example yourself, consult the example index. Edit the HTML formatting in the text area at the left and click the "Change the label" button. The label at the right shows the result. Remove the <html> tag from the text area on the left. The label's text is no longer parsed as HTML. Let us look at another example that uses HTML. ButtonHtmlDemo adds font, color, and other text formatting to three buttons. You can find the entire code for this program in ButtonHtmlDemo.java. Here is a picture of the ButtonHtmlDemo example. Click the Launch button to run ButtonHtmlDemo using Java™ Web Start (download JDK 7 or later). Alternatively, to compile and run the example yourself, consult the example index. This section discussed how to use HTML in ordinary, non-text components. For information on components whose primary purpose is formatting text, see Using Text Components. If you are programming in JavaFX, see HTML Editor.